BBC NEWS | UK | Magazine | Can a home wind turbine make money? Can a home wind turbine make money? Household windmills are becoming quite the fashion, apparently, but can they make money? Domestic wind turbines have been described as "the new handbags" - the latest luxury items craved by those who want to be first to try new technology. But this description overlooks their green credentials, because electricity powered by the elements does not emit CO2, which is blamed for global warming. And there are also the financial motivations. 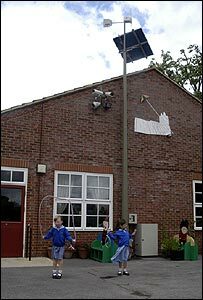 A household with a windmill can save money on bills and sell excess electricity back to the national grid. So could wind turbines become a nice little earner? Shop around - do you want a roof-mounted or garden one? They are certainly on the increase - 7,000 households have been given grants to get the turbines installed. A report this week by the Sustainable Consumption Roundtable envisages a future where households generate their electricity at home, using wind, solar and heat energy - but only if the government bought panels and turbines in large quantities for public buildings, so costs fall. "Then we could all afford them," says Alan Knight, the group's chairman. "To install a generator or solar panel today you need specialist help. You should be able to buy one at B&Q and stick it in yourself." Turbines come in a range of sizes, prices and powers, and living close to neighbours can make planning permission problematic. 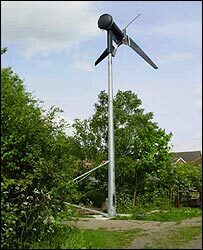 David Nisbet put up a 6kw turbine in his Essex garden in May, after overcoming 22 planning objections from neighbours about noise and visual impact. It is 11.5m high to the tip of the blade and it cost him £10,000, plus a £5,000 grant. His motivation was both financial and environmental and he was inspired by seeing two windmills at the Ford plant where he works. Although he says the concerns of others have been allayed, the first few months haven't been as windy as he hoped. "In the last eight to 10 years we've had strong south-westerly winds but not this year," he says. "It's been fickle and I'd put this six months down as a lean year. "It's been generating electricity but not as much as I had hoped for. It's connected to the grid and any surplus flows back into the grid." The wind provided 80% of his electricity in the summer and he estimates it will heat the house through winter, thereby saving him a total of £1,000 a year in heating bills. In 10 years, he hopes to have paid off his investment, but he will still have been buying electricity from the grid during that time. It isn't possible to be totally dependent on wind because it doesn't blow every minute, says Alison Hill at the British Wind Energy Association. "You may get the 4-5,000 units a year to run a household but not every single hour of every day so you would need to have standard electricity grid connection to get electricity from the grid. "We are quite lucky in the UK because when we have most wind we have most demand - winter. That profile of generation is quite beneficial, but no-one can have 100% self-sufficiency on wind alone. "If it looks like you have a big wind resource and a good turbine, you can connect that turbine to the grid and sell that, so there's an additional revenue for householders there. "Typically, a household sees a reduction of between a quarter and a third in its annual electricity bill." Solar panels can supplement wind to boost a home's renewable sources but some households do claim to make a profit purely from wind, by generating so much electricity that the amount they sell back is greater than the amount they buy. That would require a very energy-efficient house and living in a particularly windy part of the UK, says Ms Hill. And the future is bright - despite the end of government grants in February - because big companies like British Gas are investing in new kinds of turbines which have yet to come on the market, she adds.